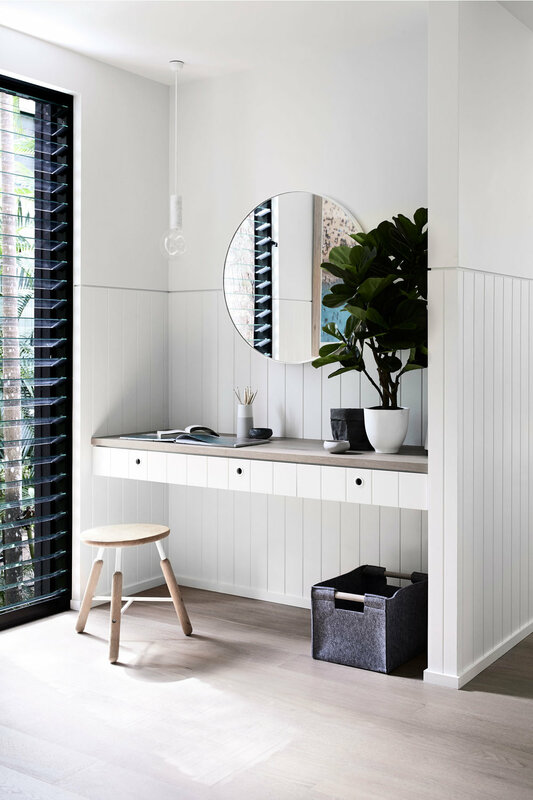 The surfboards propped in the entryway of this peaceful 650-square-metre house set in the lush rainforests of Queensland’s Noosa National Park set the tone for what’s in store. The spectacular location uniquely combines treescapes and seascapes, and left an immediate impression on its owners — two Australian sisters with young families looking for a coastal retreat. A planked boardwalk leads guests through the tropical rainforest surrounds to a small entry vestibule flanked by surf gear and other beach paraphernalia. The small space opens up to an airy extension bathed in natural sunlight, including an open kitchen, dining area and outdoor balcony. ‘The balcony is like a second living and dining space in the summer months’, says Fanning. Beyond the central island, a glass backsplash frames views of jungle palms, highlighting the integral indoor-outdoor design of the home. The home’s relaxed holiday vibe is achieved through a mix of natural materials and a simple colour palette. Natural stone, timber flooring, concrete and charred timber cladding, and copper detailing contribute to a subdued environment for rest and relaxation. In the bathroom, subway tiles in a vertical formation echo the high-reaching palm branches visible through new black-framed windows.